This is a 4 1/2" wide, 3 section stackable Washi Tape holder! My company carries it and it's so nice to have my tapes at hand! Since I'm not supposed to promote a company that's all I'm going to say about it. I don't want to get into trouble. 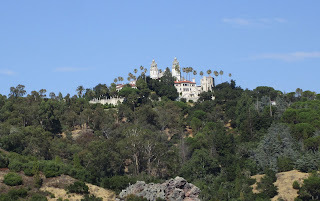 They took us to the Hearst Castle in San Simeon! I gave the link to it's official web site so just click on the name. We spent a couple hours, 1 on a tour of the Grand Rooms and 1 walking around. I took a bunch of photos with my little Canon Point/Shoot camera and got them downloaded to my desktop (brand new!) computer. This picture was taken as we were heading back down to the visitor center on the bus. I highly recommend visiting if you're ever in the area. Ok, end of all promos. Time to get back to the business at hand. Please head over to the Stamping Ground to check out the links to other desks. You'll see some great projects and more! Hi Carol. Sounds like you have had a really lovely time. What a long time since you saw your family. Goodness... could I bear that? Fortunately, Britain is not that big, so travelling to see my girls, their hubbies and their children is comparatively easy for me. great fun washi tape storage. I'm so happy for you that you had such a great time with your family - the Hearst place looks amazing and well worth a tour around. Well done on your stash sorting, I think it's a good thing to do, very cathartic! I'm glad that you've had time to visit your family in CA. Lovely San Simeon view too. That washi tape storage is very nice. I'd never seen one before. 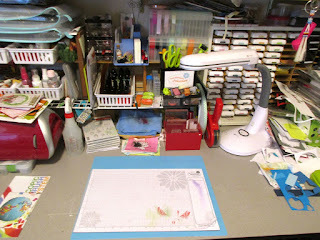 Your ribbon-and lace-station is very clever! I wish I could have done the walk around the castle too. Two years..it feels like forever when you say it in context to seeing each other, but in reality it just flies past and you have to literally plan i ti n or it could be longer. Hope you had a marvellous time with them. I must say, Hearst Castle looks fab, it fascinates me that someone should actually build a castle within modern day times...i think over here we would refer to it as a bit of a 'folly'! 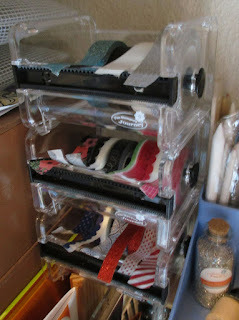 I dont have enough washi tape, but I do like the holder very much, what a grand idea. I have no problem with you linking to your supply, honestly....it's good enabling. The 'blatant' stuff I dislike on WOYWW is more the people who obviously only join in to promote products, where every other line is a link to a catalogue! I need to purge. Instead I've been hiding stuff in drawers! Lol.